It’s hard for me not to think of League of Legends as a social experiment: Five strangers, thrown together to solve a problem (made up of a series of problems). Sometimes it works incredibly well, other times, it goes incredibly poorly. I still don’t know if the single most important factor for success is execution or communication, but I have learned that communication matters a lot more than I initially thought it would. After thousands of games, I have noticed some unsurprising patterns: optimism, clear and specific communication, and goal-oriented planning are consistently effective; negativity, blame, malice, and angry generalizations routinely lead to failure. While some games can be won with relatively little communication at all, I have seen negative communication cause losses that would not have happened amid total silence. Like a lot of Americans, I’ve been reflecting on the most recent election cycle. As someone with an interest in language, political science (the effort to describe and explain political phenomena), the effect of media on individuals and society, and a little US history, I am particularly struck by the current state of political discourse in the US. The USA is a weird country from its inception. Before, during, and after the Revolutionary War, the country was arguing- constantly and continually- about the correct decisions for its political structure. What makes this weird is not that there was disagreement among the revolutionaries—every revolution has factions some internal struggles. What makes the US peculiar is that the revolutionaries kept debating, writing, and arguing. For years. Decades, even. They didn’t kill each other (except Burr v. Hamilton? ), they didn’t just decide the other side was too stupid to see reason and give up, and they didn’t quit. This pattern for ceaseless debate and argumentation was the hallmark of US politics until about 1852, when the last two really great debaters and negotiators (Clay and Webster) died—and the nation plunged into Civil War less than a decade later. But despite ongoing differences in an ever-expanding nation, the Federal government continued to debate and argue until they found a way to work together. Throughout most of the 20th century, Congress was divided into Red and Blue teams, but those teams repeatedly worked together for the greater good of the nation. It’s always hard to tell how your own time period compares to the times you never experienced. But I think there’s some objective evidence to support the claim that the US is more divided than it was at any time in the 20th century—and maybe at any time outside of its civil war. There are a lot of problems and concerns facing the American people and the US political structure. Though it appears less immediate than some of those problems, I am most concerned about the condition of discourse. I am most concerned about this because it is an indispensable tool for politics in the US. If citizens and politicians cannot (or will not) rise to the level of the first 100 years* of political discussion and effort, I don’t know how much of America (as ideals, laws, political norms, etc) will survive the next few years. I am concerned about the future of a nation founded on debate and compromise that has no capacity for debate and no tolerance for compromise. I don’t know what comes of an America that loses its ability and willingness to doggedly wade through complicated political issues to reach understanding and compromise. If the past is any indication, it looks like 1860-1865. I hope I’m just being an overly- anxious alarmist. I’ve had plenty of games where communication broke down, but then recovered. *Let’s be real: it was not all sunshine and roses. Jefferson v Adams is up there in for the dirtiest smear campaign in US history. And the only assault of a US Senator, BY a US Senator, on the SENATE FLOOR, happened just before the Civil War. I don’t want to over-romanticize the past. How You Play The Game Doesn’t Matter If You’re Losing the Sport. This year started with the gaming news that Blizzard bought MLG. With Overwatch in beta, Hearthstone and Heroes of the Storm enjoying steady, casual game play, and Warcraft capping off its gaming legacy with a transition to a different medium, Blizzard is in an interesting place to double-down on its efforts to dominate the eSports market. I’m skeptical of the prospect of Blizzard creating the “ESPN of eSports,” of course. The NFL doesn’t own ESPN. If they did, who would get prime air time when football and baseball season overlap? Blizzard is incentivized to promote their own products over the products of their competitors. I don’t think there’s anything wrong or shameful about that, but it should be pretty obvious that there is a glaring conflict of interest in Blizzard prioritizing between tournaments for Overwatch and DOTA2 (owned by Valve). I’ve written a little about the distinction between art and entertainment before. While they can overlap, they really have different goals: art wants to explore or express something about the world, while entertainment wants to sell something (usually itself, sometimes also a sponsor). Games want to be played; sports want to be won. Games* are meant to be fun in themselves, and they are played well whenever they are enjoyed by the player. Features such as scores and objectives can orient the player within the game, and provide context and direction, but a game need not rely on these features to achieve delight. Playing a game is, at its core, an aesthetic experience**, and how well you are playing can be judged largely by the extent to which you are aesthetically engaged. Sports might be fun to play, but their raison d’être is “play to win.” The joy of sports is derived from victory, not from the mere act of competing in them. Features like scores and objectives are core to the experience, and their absence would be disorienting and entirely destroy the endeavour. The activity itself doesn’t need to be enjoyable, and there are right and wrong ways to play. A good sport might also function as a good game, but it must function as good entertainment in order to be successful. A stronger delineation between games and sports would allow developers to understand and focus on the proper goals and objectives. 2016: The Year of the Mouse? With the year starting with some esports hype, and steady growth in esports for the last 5 years, will this year be the year of esports? No. It will be a year of esports, but not the year of esports. There are still the same barriers for eSports that Extra Credits noted almost 4 years ago, and an ESPN of eSports won’t solve those problems. Indeed, a true ESPN of eSports (with even half of that level of cultural penetration) can only be possible after overcoming most of those barriers. The photo at the start of The Guardian’s article is pretty telling: the photo itself clearly captures a massive logo that reads “ALL-STARS,” and the caption calls it the World Championship finals in Paris (not to mention that the Paris finals were held theatre-in-the-round style, which the photograph clearly does not depict). It’s a simple, harmless error, but I think it reveals two things about the mainstream relationship with esports at the start of 2016: 1) no one knows about it (to catch simple things obvious to anyone “in the know”), 2) no one cares about it (enough to do simple fact-checking). Esports will grow this year, but I’m not sure how much or in what ways. *Philosophers of Language have talked about the difficulty in defining a “game.” Wittgenstein also outlined a theory of language that treats language as a game, in which words are pieces within the game, and their meanings are the moves a piece can perform. ** Kant’s philosophy of aesthetics centers on the concept of “play” between the mental faculties of reason and imagination. “He’s my favorite,” always comes the excited reply. The tantalization is a two-parter: the filing basis and the goods description. 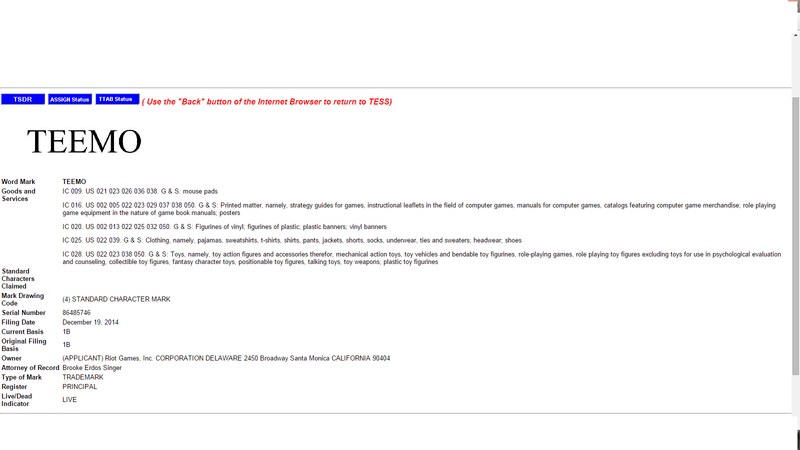 The first registration was filed on the basis of “1A,” meaning the product (the video game) was already out in the market and Teemo was all over it. This second registration, however, is filed on the basis of “1B.” That is the filing basis of “Intent to Use,” and the company registering the mark promises that they plan to use this mark in commerce in the next 6 months. What important lesson do we learn from the trademark database? Just to be clear: This is all public information. You don’t need a special password to use TESS or read applications for trademarks before the USPTO. You don’t have to sneak into Riot Offices to find out about this. Trademarks are one way that you can read signals of a business strategy. As businesses depend more and more on brand recognition and good will, trademarks become another language of business, like finance or marketing. The sad, hidden snag about this is that a 1B application isn’t a promise to actually make the product(s) described on the application; it is a promise that there is currently a plan to make the product(s). So this application is not exactly a promissory note for a Teemo Action Figure. It is more like a promise that Riot has seriously thought about it. But that’s still exciting for little Xavierathon. Capitalism FAQ: Should You Respect or Abuse Your Customers? No one likes to see a winner kicking the loser on the ground (unless we really, really hate the loser). We accept within our society that there are differences between people: that some will be more powerful or wealthy than others, and that’s just part of life. One of the limits on our acceptance of some inequality is the visceral rejection we have of abuse, of excessive exercises of power that do more to satisfy a desire to exercise power than actually further some external cause. So, that’s one reason to be unhappy with Taylor Swift and Katy Perry right now. These two ladies, through their lawyers and legal entities, are making great efforts to enforce intellectual property law against their fans— the very people who support and adore and ultimately finance their lives. There is good reason for us to judge harshly the multi-millionaires who attack the average citizen, but this is not a blog on Marxism or justice or truth. I’m here to write about law and video games. So, let’s compare two approaches to intellectual property law in the 21st century. Let’s compare the business models and legal approaches of TS/KP with RiotGames, Inc. The framework to keep in mind is that most intellectual property laws don’t have to be enforced. There is no rule that you have to go after people for copyright or trademark infringements (generally). Yes, there are some sacrifices you make by not enforcing some of your rights, but it’s still a choice. Though neither of them would like it (I guess they’re in some kind of feud, because being rich, acclaimed, and famous isn’t enough to overcome basic human failures), I’m comfortable using TS and KP interchangeably for this analysis. They offer the same goods and services for pretty much the same prices. So, their business model is $1 songs on iTunes, monetizing YouTube music videos, $100 concert tickets, royalties for radio and online audio services, sponsorships, appearances, and merchandise. They (with their enormous business operations) make musical products and sell them in the same way that musicians have since radio (with basic adaptations of the same model for television and internet). RiotGames, Inc. develops, publishes, and maintains one of the most played video games in the world. Riot does not charge anyone to play the game. They do not charge for downloading, registering, playing, or for any other use of the game permitted by the EULA and TOS agreements. They will accept money for optional, purely aesthetic enhancements to the game, but this is the extent of their revenue (not counting their e-sports operation, which is distinct from the game and heavily guarded by NDAs that make analysis and explication difficult, if not impossible). It seems obvious— even intuitive– that the business approach which demands more money would be the one to allow fans leniency with intellectual property. After all, KP/TS take in millions each year, so they certainly don’t need the extra potential money from meager merchandise sales to cover their expenses. Of course, for reasons we don’t need to explore, TS/KP are hell-bent on making sure their fans get no enjoyment from their manufactured musical entertainment apparatus without permission and a fee. Equally intuitive is the idea that a company that gives away its only product must certainly be cautious and guarded with its intellectual property. That company needs alternative revenue sources, and almost everything it does is only recognized in a world of strong copyright and trademark protection. And yet, RiotGames has actively encouraged fans to interact with their work in every medium of creative expression. They even created a venue for fans to share and display their art, music, videos, poetry, and sculptures. Here we have two different models, laid out for comparison. There are several questions worth asking: Which model is ethical? Which model shows respect for the fans, for the art, and for the artist? Which model engenders a sense of community and mutual appreciation? Which model will thrive in the 21st century? 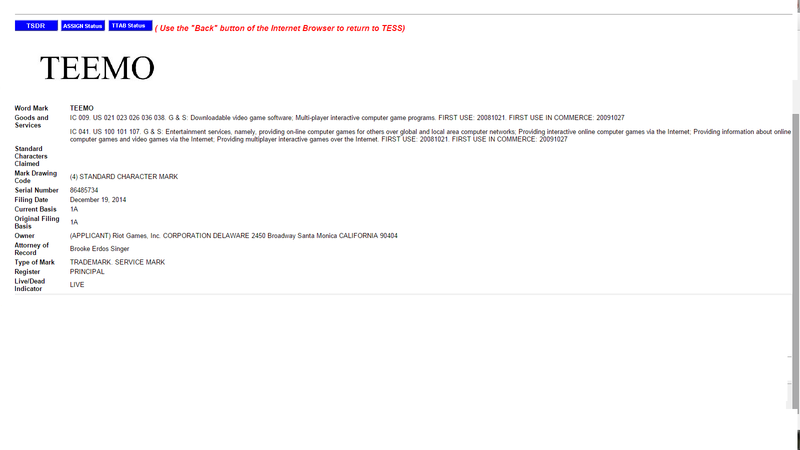 RiotGames, Inc: 624 million (2013), maybe over 999 million in 2014.